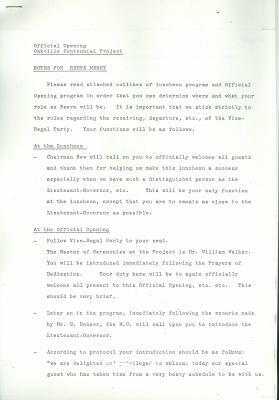 Merry, Herbert, Reeve ; Walker, William ; Bonsner, S.
Please read attached outlines of luncheon program and Official Opening program in order that you can determine where and what your role as Reeve will be. It is important that we stick strictly to the rules regarding the receiving, departure, etc., of the Vice Regal Party. Your functions will be as follows. - Chairman New will call on you to officially welcome all guests and thank them for helping us make this luncheon a success especially when we have such a distinguished person as the Lieutenant-Governor, etc. This will be your only function at the luncheon, except that you are to remain as close to the Lieutenant-Governor as possible. - Follow Vice-Regal Party to your seat. The master of Ceremonies at the Project is Mr. William Walker. You will be introduced immediately following the Prayers of Dedication. Your duty here will be to again officially welcome all present to this Official Opening, etc. etc. This should be very brief. - Later on in the program, immediately following the remarks made by Mr. S. Bonser, the M.C. will call upon you to introduce the Lieutenant-Governor. - Immediately following the Lieutenant-Governor, you are to return to the rostrum and thank His Honour for being with us. -The Master of Ceremonies will take over from you.